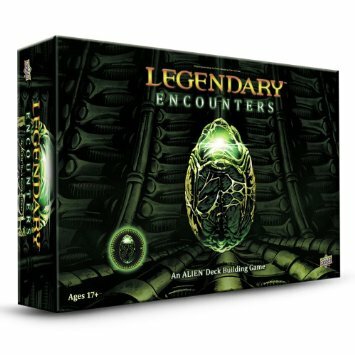 What is Legendary Encounters: Alien? 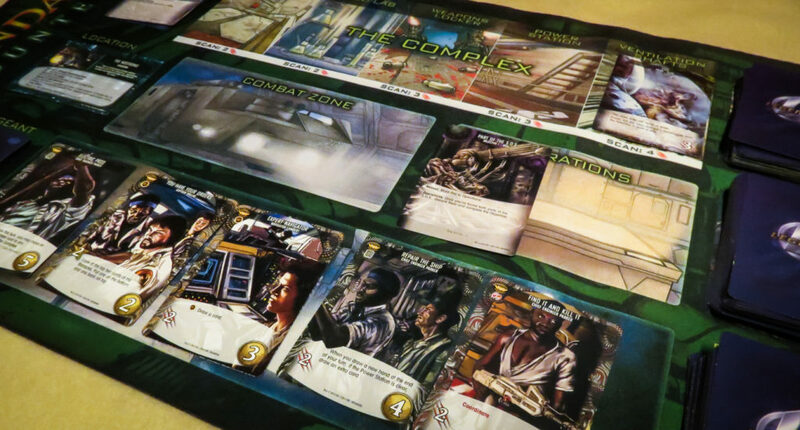 In Legendary Encounters: An Alien Deck Building Game, players build decks comprised of characters from the four Alien movies and must fight off the oncoming Xenomorphs. When playing through each scenario, you must complete multiple objectives in order to win the game. At the start of the game, you will have to decide which of the Alien movies you want to play through. Players all start off with the same basic decks of cards except for their character card, which gives them a unique ability throughout the game. There are three objectives in each scenario, and each has its own small set of cards.These cards are mixed together with a certain amount of “drone” cards, which add a bit more randomness to the scenarios. This is what’s called the “hive deck” and it’s what you’ll be dealing with throughout the game. At the start of a player’s turn, a new card from the hive deck is placed face down in The Complex. These aliens remain hidden until someone scans the room they’re in or when they make it to the Combat Zone. Players can then use their cards to recruit new characters, scan rooms, and attack aliens. Other players can work cooperatively with the current player by using Collaborate cards, which gives him/her extra resources. If any aliens make it to the Combat Zone, the current player must take “strike” cards, which usually inflict damage. Players end their turns by drawing back up to a full hand. The aliens win if all of the players are killed before completing all of the objectives. The players win if they are able to complete all of the objectives. That is a very brief overview of how to play Legendary Encounters: Alien. If you want to see all of the rules of the game, check out the official Legendary Encounters: Alien rulebook (PDF). Legendary Encounters: Alien simply oozes with theme. Even if you didn’t see the Alien movies, you will feel the tension rising throughout this game. The artwork on the playing mat and on all of the cards does a great job of bringing these movies to life. Even though the game is a bit of a headache to set up (see below), it actually isn’t very difficult to understand. Once everything is laid out on the mat, it is very easy to teach someone how to play. This is great since players are able to focus on the story that plays out rather than on what they’re supposed to be doing. The biggest difference between Legendary: Marvel and Legendary Encounters: Alien is the “reveal” mechanism, which is thematic and fantastic. It forces you to take chances so you don’t get overwhelmed by the aliens, but you never know what’s hidden in the Complex. It’s just so cool and never gets old. The deck building is also very cool and it adds plenty of strategy to the game. You will have to think about how each of the cards can benefit your specific deck. This atop our list of top co-op deck builders. Easily the worst thing about this game is the setup and breakdown times. Since different cards are used for each game, you will have to separate and mix decks in order to get the board prepared. Plan out an extra 20-30 minutes for setup/breakdown. As others have mentioned in the past, it would be nice if Upper Deck would separate all of the cards in their Legendary games before shipping them out. They instead choose to mix all 600 of the cards together, making it very confusing when you first crack open the game. Legendary Enounters: An Alien Deck Building Game is amazing! My group absolutely loves challenging, thematic co-op games, and Legendary: Alien is all of that and so much more. It has a ton of epic moments that every co-op fan should experience. Even though we are big fans of Legendary: Marvel, we prefer this Alien version and it is way up on our top 40 co-op games list. What’s odd is that just about everyone in my group enjoys the Marvel universe more than the Alien universe. The game itself – and the way the theme was implemented – just works better. If you’re a fan of the Alien movies, science fiction games, tough co-ops, or all of the above, definitely get Legendary Encounters: Alien! Thanks for taking the time to read our Legendary Encounters: Alien review!